Yes, it's true; I have found yet another challenge on yet another blog and I have decided to jump right in and join. I mean, did I really think that I could possibly have enough challenges to do? Certainly not!! I love challenges and I love the way they inspire me to take my creativity to the next level. Of course, it doesn't do much for my domestic duties! So, what is this new challenge? Why, I'm so glad you asked! It is the Midnight Madness Sketch Challenge (MMSC). This is only the second week and they have an incredibly awesome prize for it as well. Be sure to visit Priscilla's blog and read all the details. For my card, I chose a Really Rust base to start. I also decided to try my hand at paper weaving, as illustrated in my latest copy of Stampin Success. It was a bit tricky at first; but I do like the results. I chose two pieces of artichoke out of my designer series hostess pack. It is a bit hard to see, since I ended up covering it up. I will definitely have to keep that technique in mind when I know more of the background is going to show. There were al ot of elements to the sketch and so I did the best I could do get them all in there. (Sometimes, I can't help but think measurements in a sketch would be nice!) I also chose Mellow Moss, Groovy Guava and Blush Blossom for my colors. This color combination made me think of a western theme, so I thought it would be good to ink up my "Howdy Girlfriend" Sophia from Paper Pretties, which I've not used in forever. The rhinestone elements in the bottom corner are just something I picked up from the sewing section at Wal Mart yesterday. The middle one is actually green, which matches the green very well in the card; but for some reason it looks silver in the photo. Anyhow, I hope you have a chance to play along with this sketch as well. I'm off to do something productive, so that I can get back to doing something creative! Have a great day, and thanks so much for visiting with me! Accessories: Corner Rounder, Blender Pens, Aqua Painters, Mellow Moss, Really Rust, Creamy Caramel markers. Cuttlebug and Traffic Jam embossing folder. Cute card and thanks for the link! I'll be checking it out!! Cute card! Thanks fo sharing your sketch!! We are so glad that you found us. 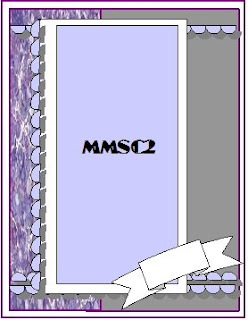 We have so much fun doing the MMSC challenges. Your card is fabulous. I hope that you will continue to play with us. 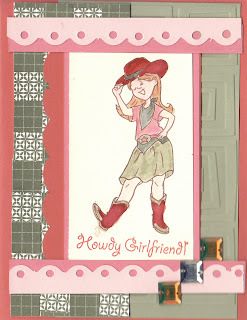 What a fun card - I love the image with her boots and tipping her hat. That card will be a very pleasant surprise in someones mail box! I know about the house! Thank you for joining us at the Midnight madness Sketch Challenge, please come again. what a cute and fun card!..and greatuse of DSP...mixing patterns TFS! love this sweet card! Gitty Up! What a FUN card! Great job on the sketch challenge this week!